just outside of my art room. a container I wanted to put into my birdcage. I had visions of a pretty vine running throughout the cage. The plant I picked out is a "Vinca"
which is actually a ground cover. vines I started to train through the cage. re-planting another vine for the birdcage. seems very happy weaving through the cage. Las Vegas and I just had to have it. it's home and is very happy. it is really pretty! perfect! 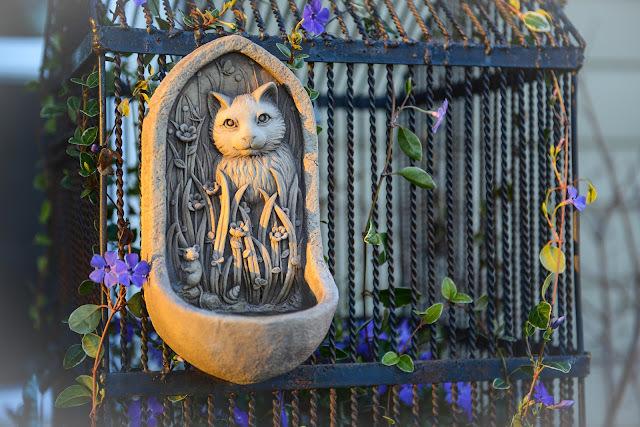 Awwww.. Those flowers are so pretty. What a nice surprise. I would have though the same thing, that I would have had to replace them. That happens a lot here as you know. Hope you enjoy that sunshine. We have rain.. YEA!!! 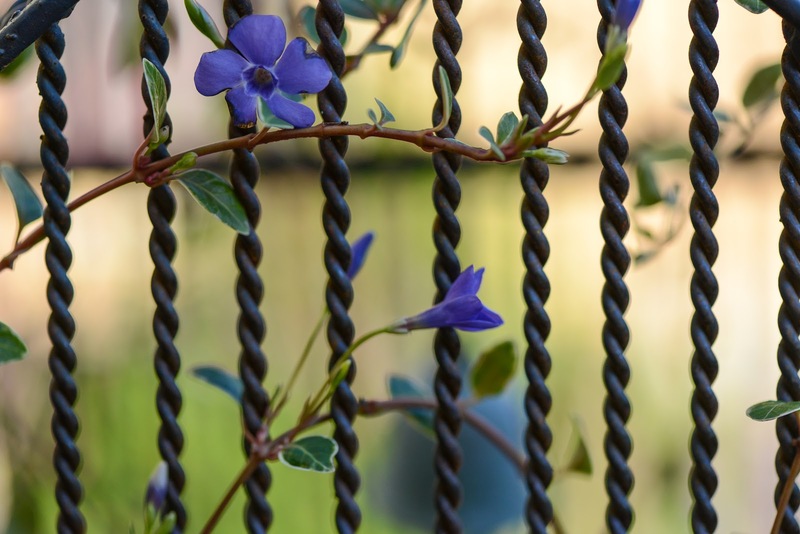 Love your photos, the contrast between the delicate flowered vine and the iron cage. Lovely view. Trying to post for a second time...that's a great use for vinca! Ours is no where close to blooming though! You must have great light up there in Kirkland. Vinca is one hardy plant; years ago we planted just one plant in the side yard and is spread everywhere. Same thing under the cherry tree. Looks like your plant really likes its cage! Hi Becca. Just popped from Monica's to admire your blog. 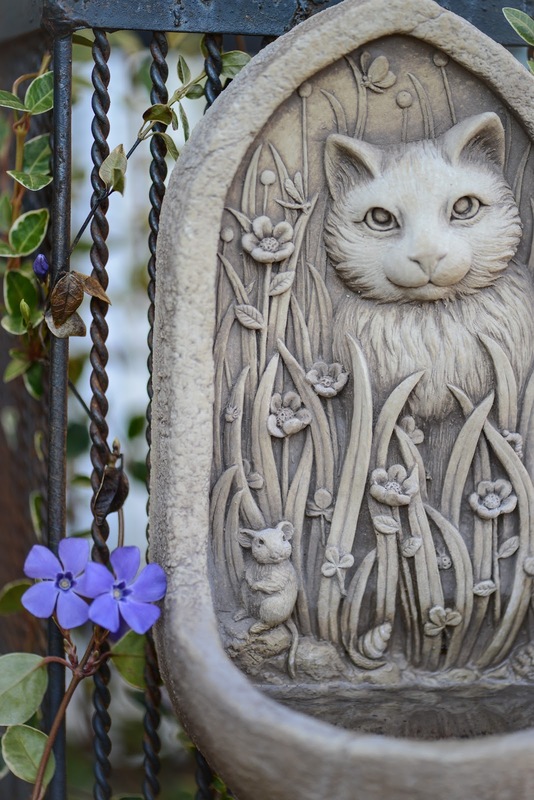 Love your photos and the Vinca's. The iron cage is awesome too. Thanks. Have a great weekend. What a great choice for your birdcage, Becca. 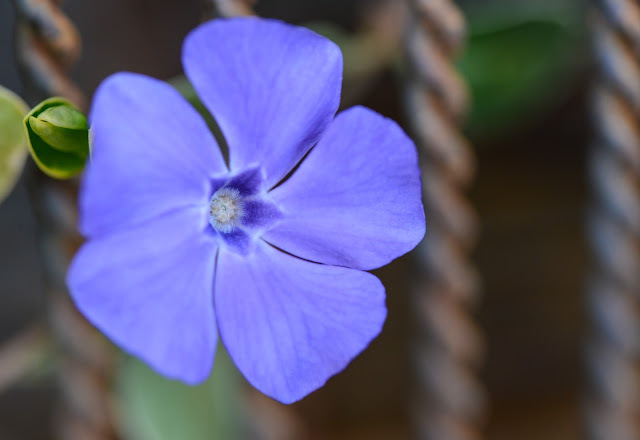 Vinca are actually very winter hardy. 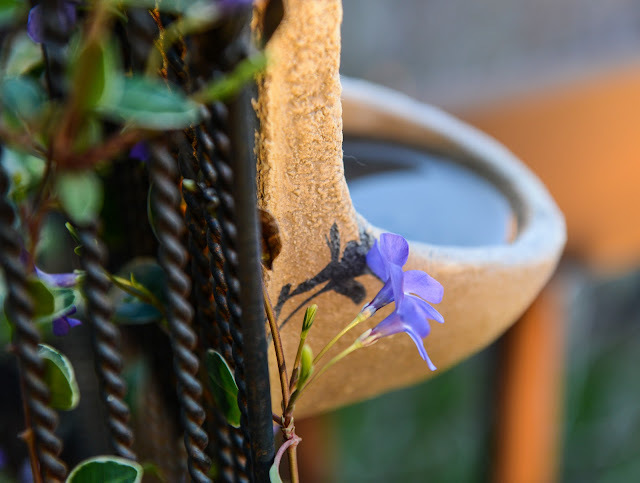 That is so pretty with that tiny blue flower. 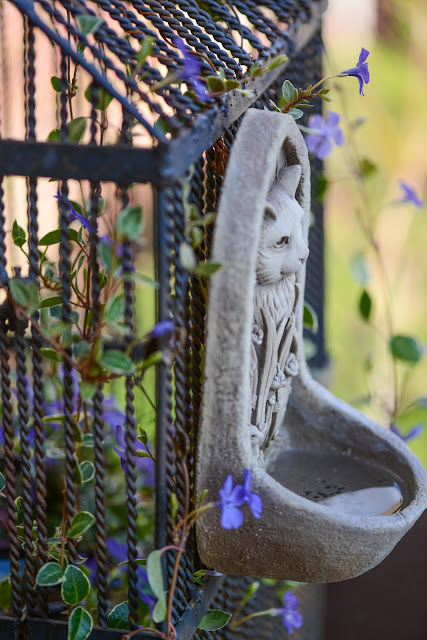 It's perfect for the birdcage. Spring is near! i was surprised to see what flowers came back every year-with the snow and cold it's amazing! it is grey and old snow is being rained on in Chicago today...your post....really lifted me! i think the vinca loves are wet climate, mine always does well from now till later in the summer when it doesn't get quite enough water. but never dies off. great addition to your bird cage. I can not tell you how jealous I am of your spring Becca. I am truly green with envy!! 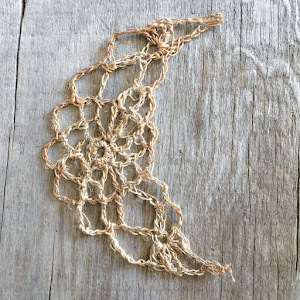 Love those cute little vines going through the bird cage! So pretty, Becca! I love vinca vine...the flowers are so sweet and colorful! Great photos! 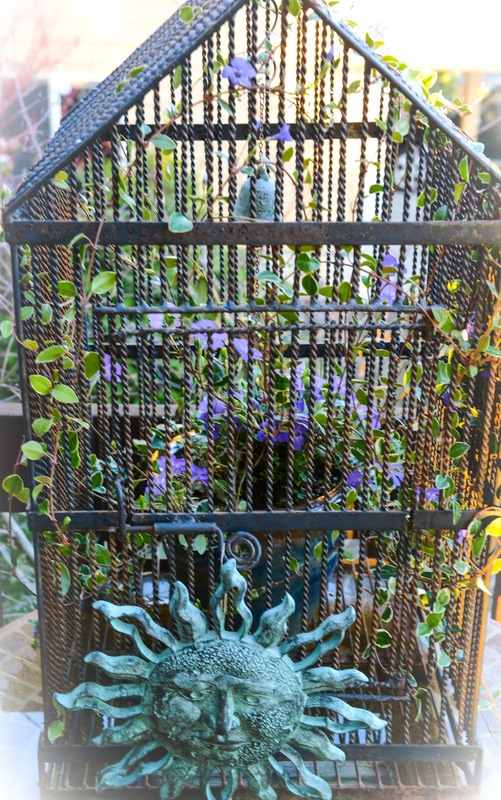 That is the prettiest little bird cage, I've seen in ages. And I love the Vinca...it's doing so very well, must love the rain. We can plant it here, in zone 5 so its' pretty hardy. 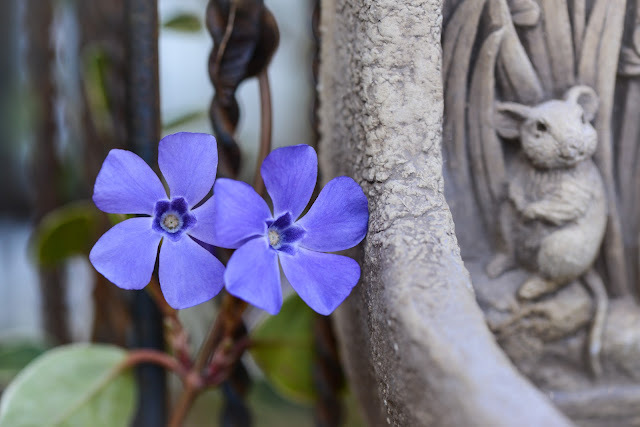 Oh how I LOVE vinca vine...it's so beautiful and comes in a variety of color. I have purple ones which seem to be the perennial and most hardy kind...but oh that soft pink variation...to die for. Your Vinca looks so pretty pretty pretty. Beautiful photos Becca! 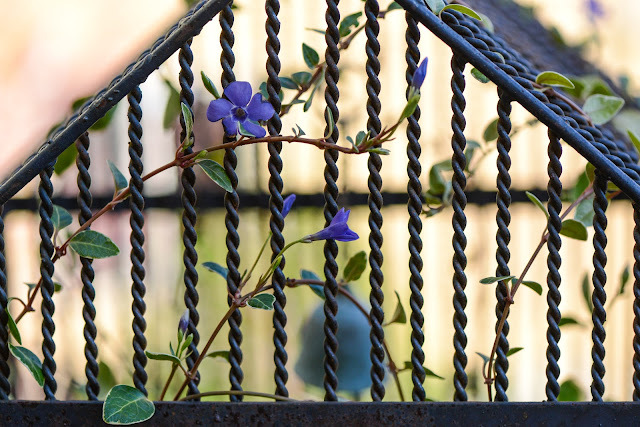 Love the cage with its beautiful flowers and vine. My world is still stuck in deep snow. it is -35 this morning!